In the world of CG and VFX, one of the developmental processes is called “look dev”, or look development. The primary goal of look development is to ensure that both the lighting and the materials in the 3D scene match real-world lighting and materials. Especially if CG elements are to be composited with live-action elements in a shot. If the lighting and materials don’t look the same, you’ll never be able to sell the shot. This means creating “photometric” lights (more on that in the “Lighting” article) and ensuring that the materials in the scene react to these lights just as their real-world counterparts would. The material that gets applied to a 3D object is called a “shader” or a “shader network”, depending on the complexity of the material. Shaders are often referred to as “materials” because that’s what they represent: a real-world material like glass, steel, rubber, skin, etc. The thing to remember is that a shader is not, in and of itself, a material; to build a material, a shader must be created and it’s attributes set to reflect the appropriate material. 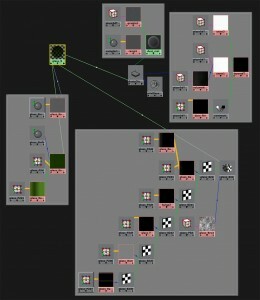 A single type of shader can be set up to represent a variety of different materials. 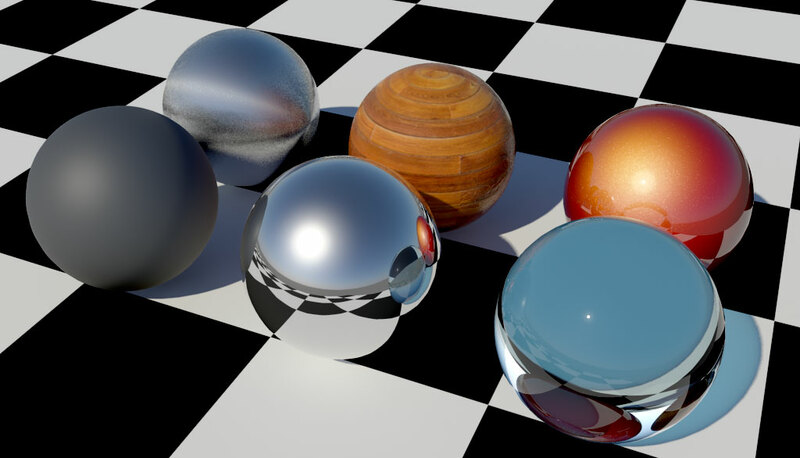 The image below show several types of materials applied to a series of spheres. Each of the materials, except the “Auto Paint,” used the same type of shader. Attributes can be set by entering a value, mapping a texture or by controlling it with some type of node. More about nodes in the “Shader Networks” section below. Although these shaders still get used a lot, they all have an inherent problem, which is that they don’t handle light accurately, resulting in blown-out highlights and reflections. When used with the default rendering engine, it can be very difficult, if not impossible, to create photorealistic materials. These days, most high-end 3D apps come bundled with a 3rd-party rendering engine. Most Autodesk products (Maya, 3ds Max, SoftImage) come with MentalRay, a product of a Swedish company called Mental Images. Other 3rd party rendering engines include V-Ray and Maxwell Renderer. These renderers produce beautiful images and are often used in the movie industry. Each of these renderers come with their own proprietary shaders, which cannot even be seen by any other renderer. 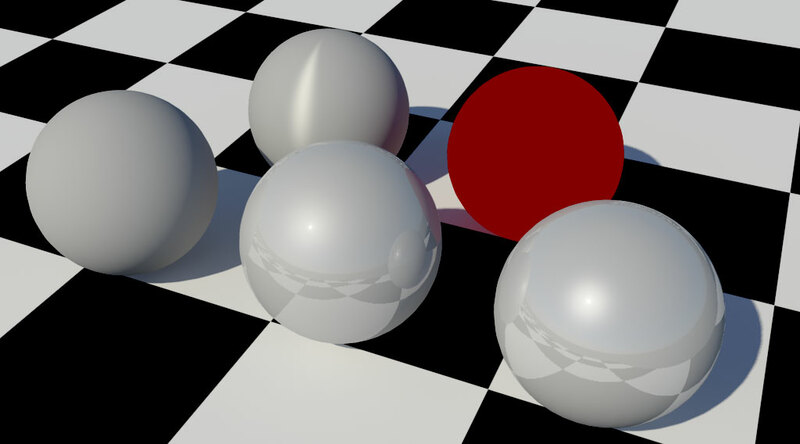 These shaders are built to calculate light very accurately and will produce extremely realistic materials. These are but a few of the many, many types of shaders that come with MentalRay. I tend to use the Architectural & Design Material almost exclusively, since it can be used for almost any material; flat, shiny, refractive—it handles them all superbly. I also use the Sub Surface Scatter materials, which handle translucency much better. Most of these shaders don’t look like much by themselves, but when used as the foundation for a complex shader network, amazing results can be achieved. Most of the time, a single shader by itself cannot always achieve the desired result. This is when a number of “nodes” are connected together to create the final look. 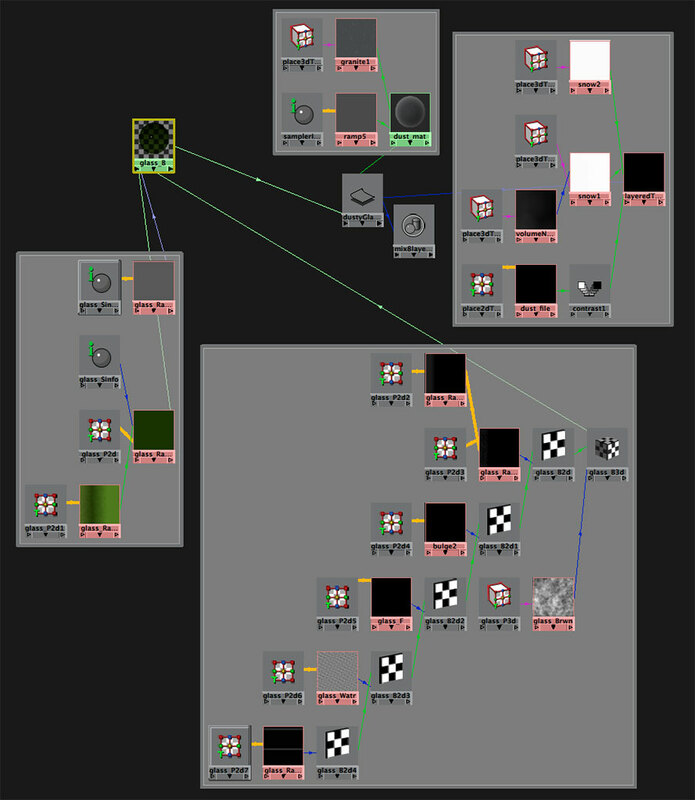 Many applications are node-based, such a Maya, Nuke and Shake (compositing software) and they all work much the same. What is a node? Good question, difficult to answer. A node is an element that stores data and can perform functions. For example, when an object, such as a sphere, is created in Maya it is built from several nodes. With a sphere, there’s a creation node that contains the options available at creation: the sphere’s radius, how many subdivisions around the axis and how many subdivisions in height. There’s also a transform node, which records how the object is moved, rotated and scaled. There’s a shape node that stores the position data for each vertex, edge and polygon in the object’s shape. Each node has a number of inputs and outputs. Datum flows from the output of one node into the input of the next node, where it is altered by that node. For example, when an object is “instanced” (a type of copy that is always tied back to the original) all the instances have their own transform node, but share the creation node and shape node of the original. Therefore, each instance can be moved, rotated and scaled, but any changes to the original’s shape is reflected in all the instances. A single shape node sends data to all the transform nodes. Some nodes perform functions, where the date that comes into the node through it’s input is transformed as a result of a calculation and the new data flows from the output. For example, a Gamma Correct node can take RGB data and apply a gamma correction to it, then send the corrected values to the next node. Shaders are nodes. Each of the attributes has an input and an output. A “File” node can be used to import a texture file (.psd, .jpg, .bmp, .tga, etc.) which can then be plugged into the “color” attribute, the “reflectivity” attribute or many others. A file node (connected to a grayscale image) can also be plugged into a “bump2d” node, which is then plugged into a shader’s “Bump” attribute. A complex shader network graphed out. As the person who is directing a 3D project, you have a couple of responsibilities where shaders are concerned. First, you need to collect info and resources about the materials. A list of all of the types of materials used in the construction of whatever objects are in the scene, and hopefully samples or photos of each of the materials, so that the 3D artist is familiar with the look you’re trying to achieve. Second, you’re either the person who decides if the rendered materials look correct or the conduit through which the approval cycle flows. This can be a very iterative process, so you need a clear vision of what each type of material looks like. You also need to be able to communicate clearly what revisions need to be made. “It needs to look more metallic” is not enough. Maybe it needs to be less reflective, maybe the reflections need to be blurred more, maybe the color of the reflections needs to be influenced more strongly by the color of the metal. Getting an object to look “photorealistic” in a render is primarily dependent upon two things: an accurate model and realistic materials. Building shader networks is an art which requires a lot of very technical knowledge. Artists build entire careers specializing in the creation of accurate shader networks. A highly-skilled shader artist is one of the key components in any 3D project that is true to the director’s artistic vision.